Big news! We've teamed up with Projective Space, an incredible membership community for growing startups, entrepreneurs and creative professionals, to provide ongoing sweatworking opportunities at their amazing Lower East Side space. We're calling it OMWork at Projective and you're invited! Click here to grab your ticket for sunset yoga + open bar networking on July 19th at 6:30pm. Join us for sunset yoga followed by a specialty cocktail open bar for an uplifting workout and social hour with some of the New York's brightest innovators. Grab a ticket for this week's OMWork at Projective event via Eventbrite and make sure to follow Projective Space and Work From Om® to stay up to date on future yoga and meditation events. 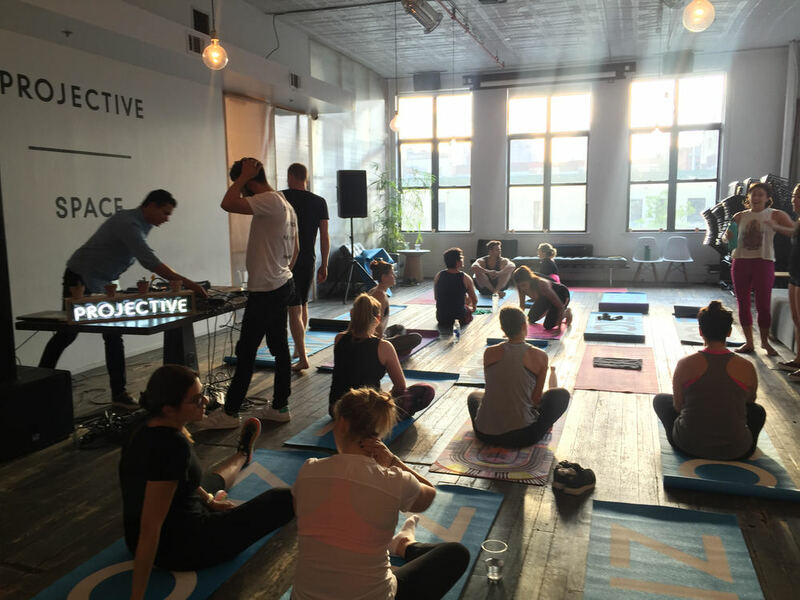 An hour of live DJ yoga began the evening as a full house of guests moved together on their mats at Projective Space on the Lower East Side. Following class, the group turned up the tempo and the energy with an open bar and networking happy hour. The “OMWork Gin-Coco”, featuring Tanqueray gin and Zico coconut water was poured all evening as the group drank, danced and made new connections. Follow Work From Om® on Twitter, Facebook and Instagram to stay up to date on all of our events!